About a week ago, I shared with you my "recipe" for Lazy Pickles. And I know. You've been sitting here waiting anxiously to see if my pickles turned out ok. Well, friends, I'm here to let you know that they did. Photo-journalism-style (aka lazy-blogging-style). Raw as can be. Just jarred. And yes, the dill is from my garden. Everything else is from the store. I punched down the kraut. Literally, take off the lid. Stick your fist in the jar. it is a very important thing to do. At this point, we went away for the weekend. The spears/romanesco looked and smelled done, so we put them in the fridge to stop the fermentation process. The rest got to chill on the counter for two more days. I think they're done. The kraut tastes like kraut. The pickles are briny as hell! Check out how cloudy that brine is! Full of fermentation and good bacteria! Time to eat! We had a few pickle spears as a pre-dinner snack last night, and they were sour, salty, dilly, briney deliciousness. I used English Cucumbers from Trader Joe's - I think if I'd used *actual* pickling cucumbers, they might not be as soft. But I really don't mind. They're totally delicious, and I kind of like the softness...reminds me of the super old pickles from the Jewish delis I grew up with. Next time, I might use even more dill, and maybe either a firmer cucumber, or just a slightly shorter fermentation period. And there you have it. 8 days. 5 days for the spears. Super lazy. Super delicious. PICKLES. 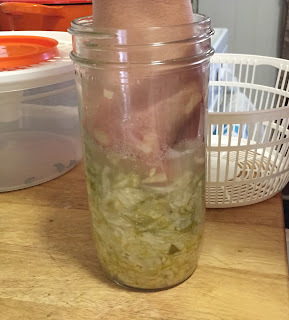 Some resources if you want to read more about this fun world: pickling vs fermenting, a little about sour pickles, basically self-fermented foods like kraut and pickles are medicine. Questions about my methodology? 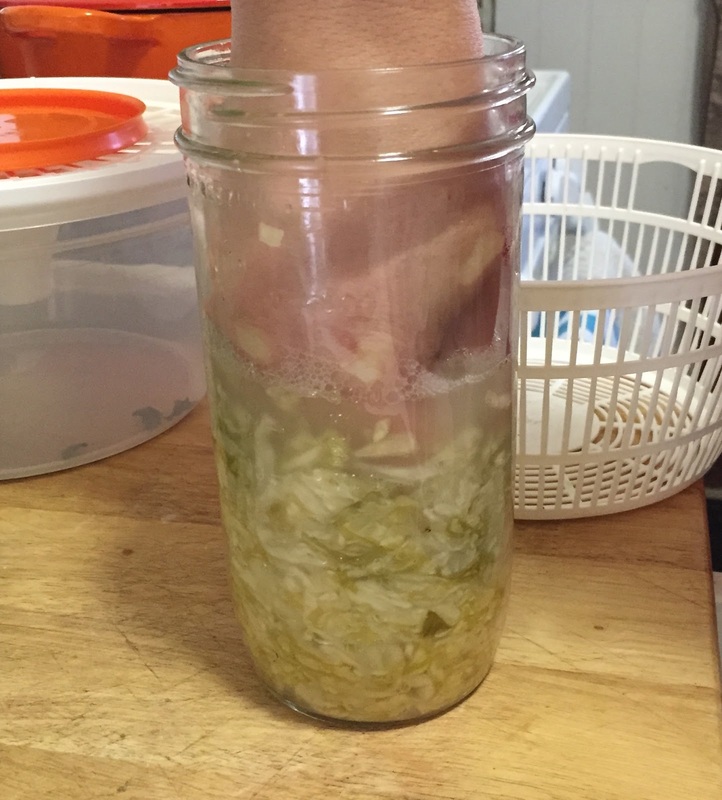 Pickling stories of your own to share? Did eating fermented food save your life? Let's chat in the comments below!